Been using QuickBooks for a while? Do you have negative amounts in your A/R or A/P reports? Can’t explain the difference in your cash balance per books and your bank balance? Do you have duplicate names that are the same customer/vendor but spelled differently? Do you have reports that don’t make sense? 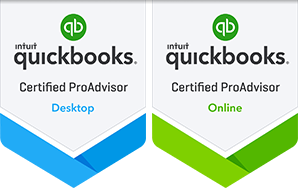 Are you only using QuickBooks for a checkbook? Do you have old uncleared transactions in your bank reconciliation? Is there a difference between your prior year reports and your tax return? Are your detail inventory reports different from the summary reports? Do you have inventory quantities with negative amounts? Does your Chart of Accounts or Item list contain too many lines, or have lines that are no longer used? Cash and credit accounts never been reconciled to the statements? Many times, these kinds of mistakes happen from lack of training or outdated processes. Other times the transactions download from an outside service creates duplicates. Let us view your general ledger and help clean up your file. We will go over the corrections with you so the chance of recurring errors is reduced. Then you will have helpful reports that make sense. Schedule a one-time clean up, or recurring visits to keep your file in good shape.